Without religious harmony, a multi-racial society would very quickly degenerate into chaos and ruin. This recognition of the importance of religious harmony in Singapore began more than 50 years ago, as shown here in the special stamp “Unity in Diversity”. In this simple stamp-based book, the author mentions the places of worship of different religions in Singapore. Hopefully, it will motivate us all to learn more about religions, and about ourselves and our fellow-men. Our next story is “Singapore Heritage: Places of Worship”. With 20 pages to be published – one page every Monday and Thursday – this short story will take us till 28 May 2009. We have come to the end of the “Singapore Story” book. 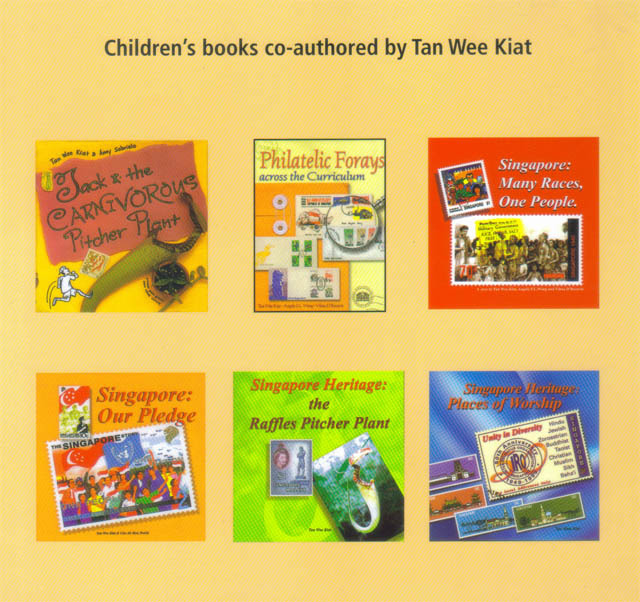 Shown above on the backcover of the book are some other children book titles which are co-authored by Dr Tan Wee Kiat. The policies and events that have transformed Singapore are credited to the strong leadership of Lee Kuan Yew, the Prime Minister of Singapore for 31 years. One other policy that he implemented was to prepare younger people to become leaders. In 1990, at the age of 67, Lee Kuan Yew stepped down as Prime Minister and Goh Chok Tong became the new Prime Minister of Singapore. 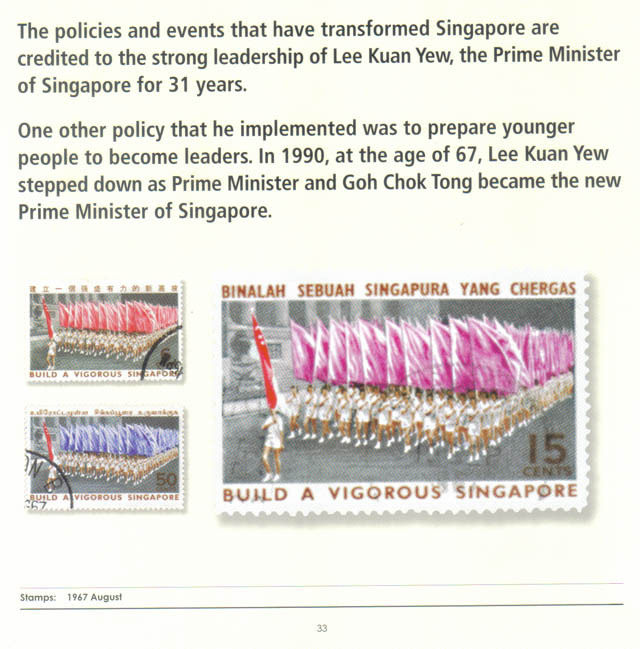 The previous pages highlighted many of the policies and events that have transformed Singapore. One illustration of this transformation is to compare the city skyline in the 1950s with that in the 1980s. 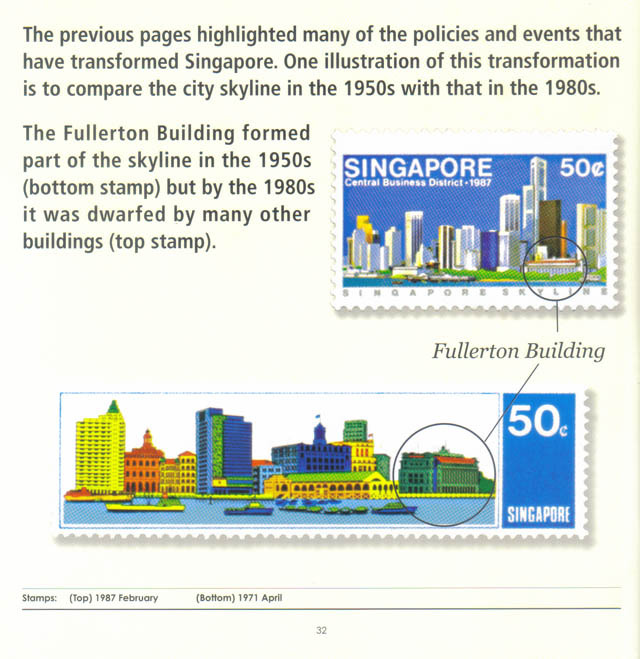 The Fullerton Building formed part of the skyline in the 1950s (bottom stamp) but by the 1980s it was dwarfed by many other buildings (top stamp). 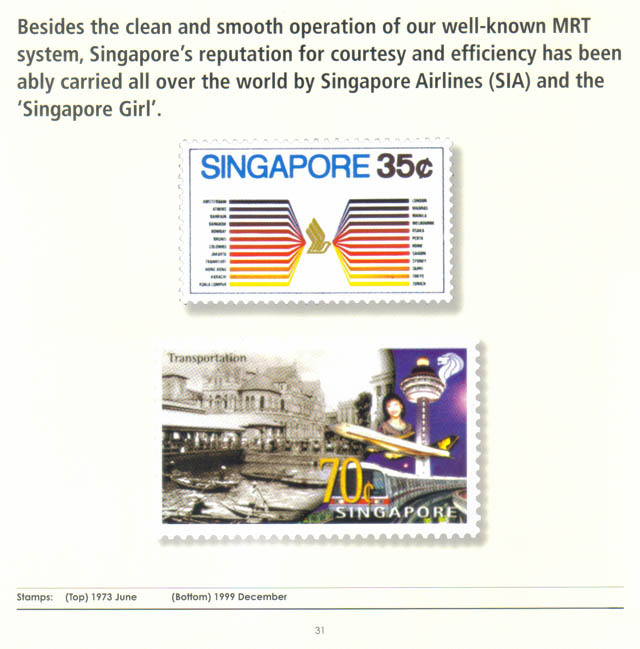 Besides the clean and smooth operation of our well-known MRT system, Singapore’s reputation for courtesy and efficiency has been ably carried all over the world by Singapore Airlines (SIA) and the ‘Singapore Girl’.